One of the most interesting parts of Christgau’s 70’s/80’s books were his Core collection section at the end of the book, Subjects for Further Research, Distinctions Not Cost-Effective and Meltdown. Only “Subjects” was in his 90’s book. As for his Consumer Guides, as much as I like his thoughts on new music, the one Guide I always looked forward to was his Christmas Best Of/Compilation one. He hasn’t done of those since he left the Voice, but with his MSN gig, maybe he’ll do another one. Re: Heartaches By The Numbers. I think it’s a great book despite their bias of the Urban Cowboy era. 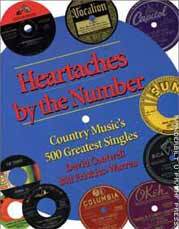 Although, at the end of the book they list an Alternate 100 and do include Johnny Lee’s “Lookin’ For Love”. Kenny Rogers does get a listing but it’s with “Ruby” and not for his crossover stuff. And Shania Twain’s “Any Man Of Mine” gets a nod at #358. 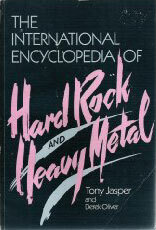 So, even though there’s no Alabama or Ronnie Milsap there’s just enough to make it an essential guide. Right on Tom. Christgau’s core collection was a cool addition to the first two books. Still searching for Gene Vincent’s The Bop That Just Won’t Stop. And many of the albums in the “gone but not forgotten” section have been reissued on cd throughout the years. I like the different perspective he brings to his reviews and I long for a cd of Crossing The Red Sea With The Adverts my own self. Marooned was just plain awful and a waste of time. It reminded me of the tribute albums that feature artists who are friends of the guy putting the record out, but don’t necc know the tributee. If Stranded (and I liked a lot of Stranded) was navel gazing, Marooned never even got TO the island. On the other hand did anyone here mention Stairway to Hell? That was informative and hilarious. Prob the last book of the ilk that I enjoyed. Thanks Chuck. I remember being really annoyed by the Spin Alternative Record Guide when it came out – I was bugged by what I thought were a lot of very sloppy errors. I marked some down and when discussing it with a friend at the time I realized that they were all by Rob Shefffield. I kind of avoided his byline for years as a result, but I’ve come to really like his stuff – and LOVE IS A MIXTAPE is a terrific book. 1. Adam Ant is referred to as ” a rock star named for a Hanna-Barbera character”. Actually, the HB character is Atom Ant, not Adam. 2. Writing about the Clash he quotes the TV Personalities “Part Time Punks, which concluded “The Clash are nice”. The line is actually “they’ve got 2.50 to go and see the Clash – TONIGHT!”. It’s not a comment about the band, put about the titular PT Punks. 3. Writing about the first Jam album: ” interrupting his own anthems with goofball cries of “youth explosion!” or ” reality’s so hot!”. The line is actually “reality’s so hard”. It’s not very “goofball” in the context of the song, either. Stanley, you missed the best one (which was quite possibly deliberate on Sheffield’s part) – Paul Dean of Loverboy as former member of X-Ray Spex! That’s an all-time classic. Actually, Chuck mentioned the Loverboy/Paul Dean thing in our conversation, which I regrettably had to cut because the audio was way too unintelligible (due mainly to me laughing loud over Chuck speaking). But yeah, it’s one of the best jokes in the entire book. Chuck – I agree totally – factual errors don’t bug me UNLESS they are used to actually support an argument – as they were in 2 of the cases I mentioned. Misquoting and misinterpreting a TV Personalities song to take a shot at the Clash seemed petty and a lazy way to do a revisionist take on the band. I think the Atom/Adam ant thing bothered me because it was made and corrected over and over again in the 80s, so I thought by the time the Spin book came out it shoulda been common knowledge. Also, there’s no such thing as factual errors when quoting lyrics; the “correct” lyrics are whatever you *hear,* not what’s on the lyric sheet (or worse, on some Internet lyric website.) If some bad British singer doesn’t enunciate clearly, it’s not Sheffield’s fault (and calling a song “goofball” is *never* a sloppy error. It’s what called an “opinion.” And yeah, the Jam were pretty goofy in my book, too. Though I bet Rob likes them more). Chuck – I think it’s true that whatever you hear is whatever you hear – who am I to say it’s not “excuse me while I kiss this guy”? And if you can follow that train of thought and write something interesting about Purple Haze based on that, cool. But I guess what rankled me is that Rob’s contention that there were goofball elements to the Jam by quoting a line inaccurately undercuts his point. I may agree with him abut the Jam tending towards being goofball (I do, actually), but even if that’s his opinion, it seems that you shouldn’t need to support that opinion by misquoting a line and pretending it meant something it doesn’t. You know what’s really goofball? The fact I’m trying to defend some things that bugged me about the book that I wrote down when it came out when I clearly am more on Chuck’s side of the argument than my own of a decade and a half back.